Your best budget PR pitch stories! Frenzied pitches, shuttling from TV studio to TV studio. Pushing for at least a quote from your client or organisation for the budget. A fevered race to get your PR pitch through! 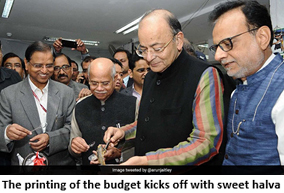 Apart from the general elections, the annual ‘Union Budget’ is the biggest PR opportunity nationally as the media devotes maximum space to the budget proposals. And Budget 2018, on February 1st, is a especially important one as it’s the Modi Government’s last budget for a policy push before the general elections in 2019. The budget in 2019 will be a ‘vote on account’, which means it can only approve ongoing expenditure, not make new policy via the budget. For this very important budget, PRmoment India spoke to some of our PR pros, about their media experiences, even as they are busy pitching budget stories. Editor says no, client says yes! Naturally, Shinde is not complaining. Out of such serendipity are great PR moments made! Officials involved in the printing are under security lockdown and can only make a cellphone call under supervision of Intelligence Bureau officials ! Journo says yes, client says no! This too is PR life!